Heat oven to 350 degrees F. Line an 8 inch, square baking pan with heavy-duty foil, folding the foil over the edges of the pan. Put butter in pan and melt in oven. Add brown sugar, corn syrup and vanilla; stir to mix. Add cereal and stir with a spoon, then mix with fingers until thoroughly coated. Place waxed paper on top and press down gently but firmly. Bake for 25 minutes until entire surface is bubbly. Sprinkle with chocolate chips and let stand for chips to soften. 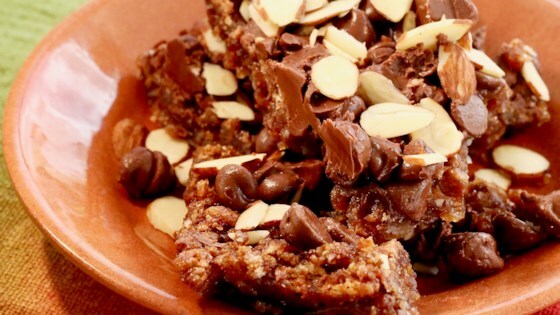 Spread chips, then sprinkle with almonds, pressing gently into chocolate. Let cool until just warm, then refrigerate at least 1 hour or overnight before cutting. Using foil as a lifter, remove from pan and, without inverting (almond would peel off), peel off foil. Cut into bars. Store in refrigerator. See how to make the chocolate lover’s chocolate chip cookie. I found the flavor of brown sugar a little to strong but my boyfriend enjoyed them. I may try this again.